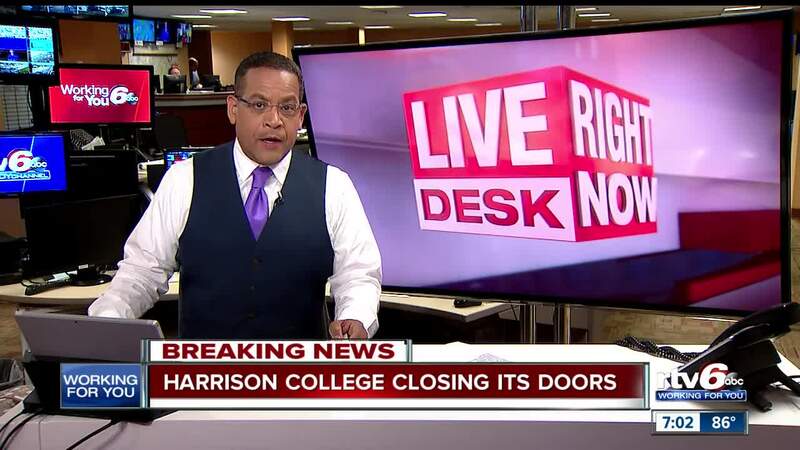 Harrison College released a statement Friday saying they have made the "difficult decision" to close operations effective Sunday, September 16. INDIANAPOLIS -- A private, for-profit college headquartered in Indianapolis is closing all of its campuses in Indiana, Ohio and North Carolina. "After 116 years serving Indiana, Ohio and North Carolina, Harrison College has made the difficult business decision to close operations effective Sunday, September 16, 2018, and for The Chef’s Academy (TCA )Sunday, October 14, 2018 (the end of their current term). We are working with transfer and teach-out partners including State governing bodies and our accreditors to ensure each student has a pathway to complete their education. National American University (NAU), an HLC-accredited institution, is Harrison College’s preferred transfer institution within Indiana. Please note that NAU is working diligently with governing bodies to expand this list, including further teach-out* arrangements with NAU and other institutions. For students in Ohio, we are working closely with the Ohio State Board of Career Colleges and Schools to identify transfer/teach-out partners. For students in North Carolina, we will be working with nearby institutions for transfer options for our students." The Department of Work Force Development, which handles unemployment across the state, told Call 6 Investigates they were unaware of Harrison College closing its doors until we contacted them. Harrison College, formerly Indiana Business College, opened in 1902. The private college is based in Indianapolis and has 11 campuses in Indiana and Ohio. The school also deleted their Facebook and Twitter pages sometime before Friday afternoon. The Indiana Commission for Higher Education, who approves all degrees and programs that for-profit schools offer, says they are working with students to help transfer them to "other educational opportunities." "We are working with Harrison College to secure student records and ensure a smooth transition for all students to other educational opportunities."